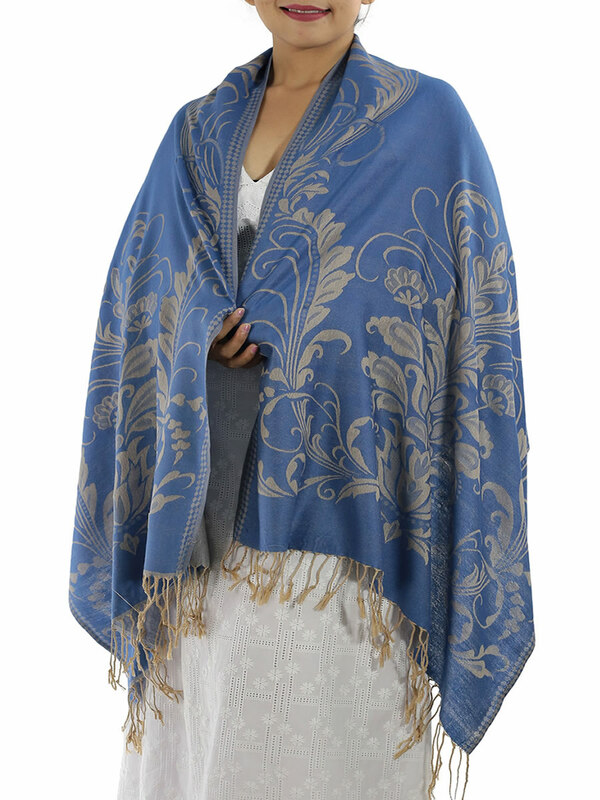 This light and soft patterned Blue Pashmina, look great draped loosely around your neck or body, and gives you endless looks and styles. 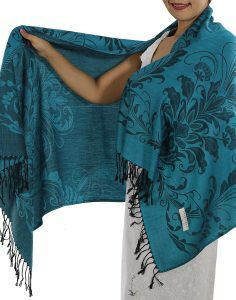 This Blue Pashmina is light and breathable, and is a sensational addition to your wardrobe, giving you relaxed look any time of year. 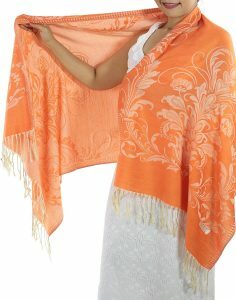 Did you know that the word ‘pashmina’ literally translates to “soft gold” in Kashmiri? 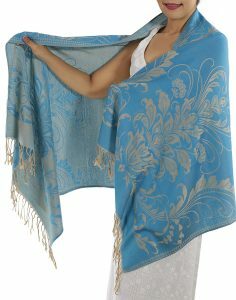 Now, thaisilkandscarf.com is able to offer you that sensation in a wonderfully simplistic floral patterned blue pashmina scarf. 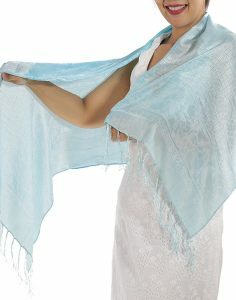 This is a unique opportunity to enfold yourself in unparalleled suppleness and comfort because blue pashmina scarf is a great way to add a worldly yet subtle twist to any ensemble. 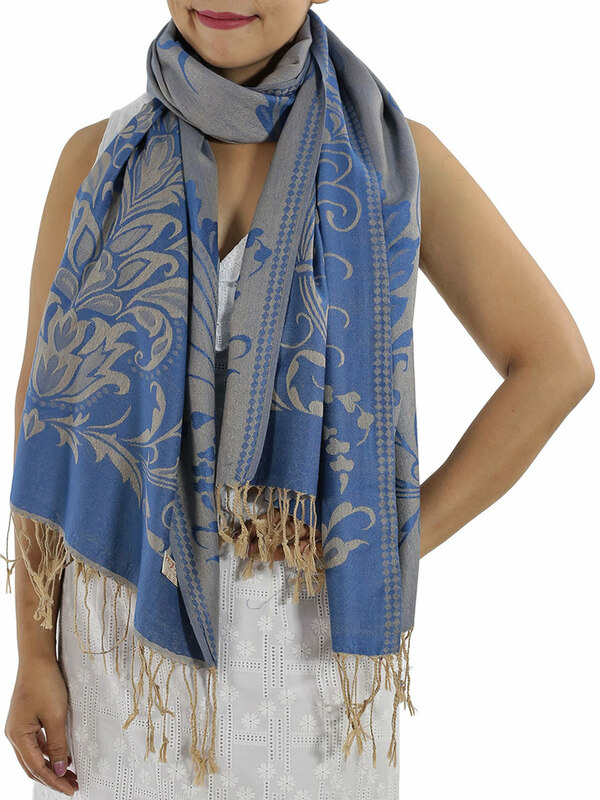 The beige tassels and floral pattern make this blue pashmina scarf the ideal way to protect your upper body from the autumnal and wintry winds. 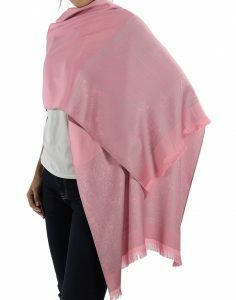 It effortlessly adds a splash of fashion to a basic outfit of blue jeans and a blouse or a seductive removable layer to cover an evening dress for the brisk walk from the car to a restaurant on a date night out with your husband. 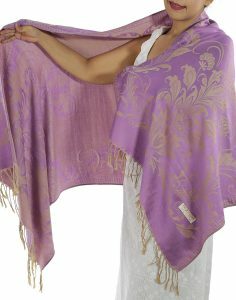 There is no limit to the functionality of a blue pashmina scarf because you can tie it in so many different knots in order to accentuate a different part of your body or personality. 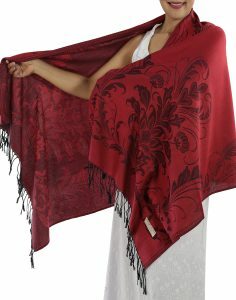 If you want to show off your graceful neckline, you can tie the scarf in a neat ‘double wrap French’ or ‘Pan Am’ scarf knot. 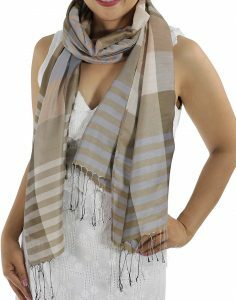 If you want to add a little bit of European chic to your outfit, you can tie it in a classic ‘muffler’ knot, or better yet, just wrap it around yourself in a ‘double loop’. 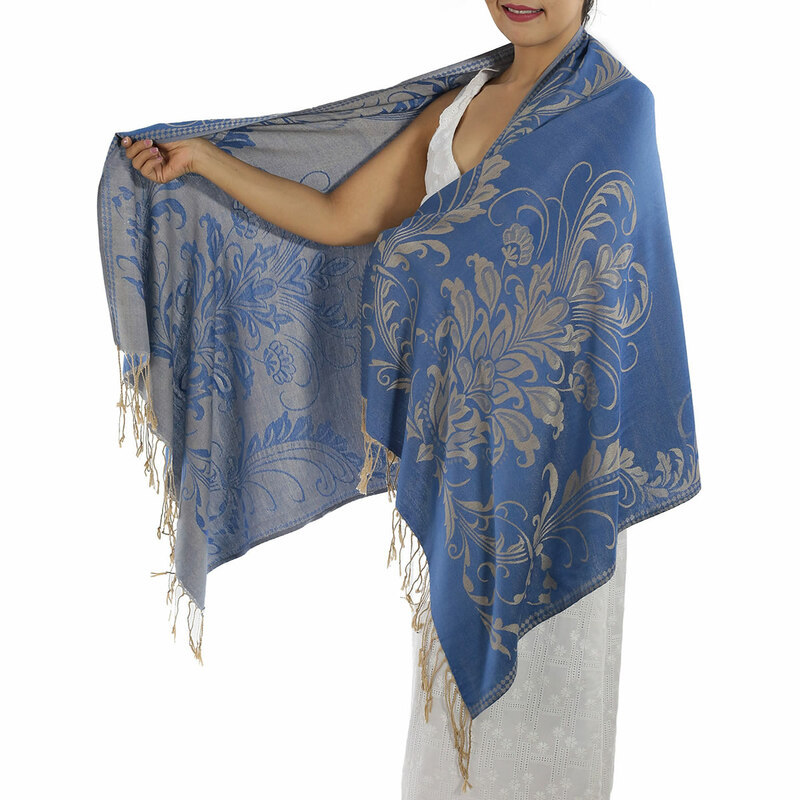 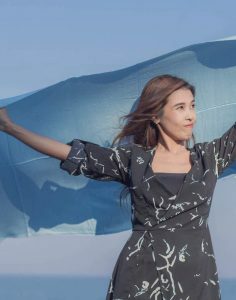 No matter how you decide to use it, there is no better place to get a Thai pashmina scarf than from the reliable family wholesaler of thaisilkandscarf.com and our floral patterned blue pashmina scarf is the epitome couture. 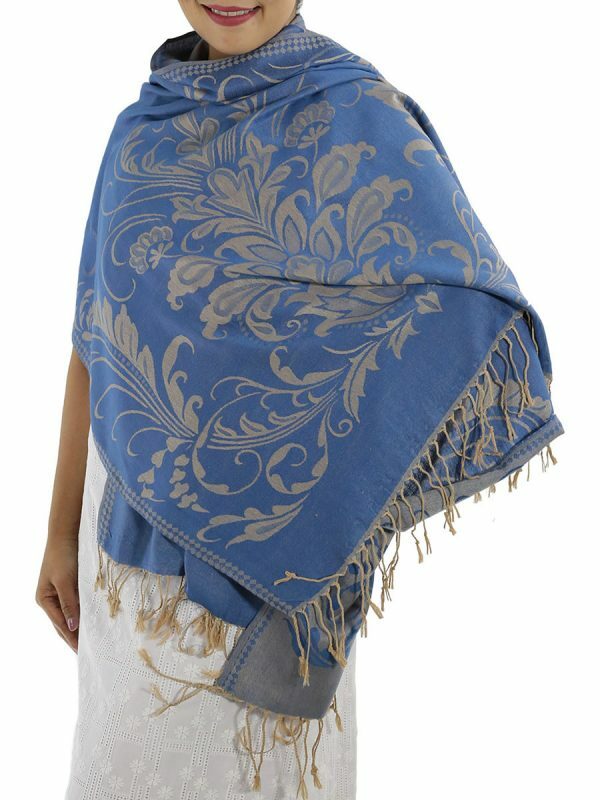 So, why not order your patterned blue pashmina with us and be wrapped up in the luxuriousness of the combination of a rare type of cashmere and Thai silk? 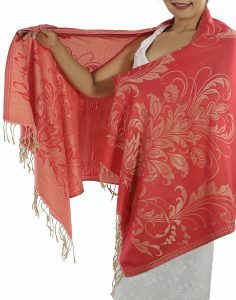 We will ship it to your doorstep in ten days or less and you’ll be glad you did.